If you’re looking for king salmon, coho salmon, lake trout, brown trout, steelhead, splake, brook trout or whitefish, these lures will work! Check out the online store to see all the colors and styles we have. 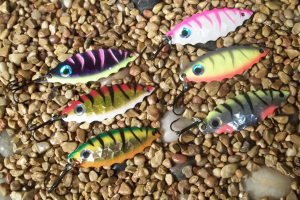 Our trolling flutter spoons have an outstanding action and flash that mimic forage species such as smelt, herring and shiners. They work great behind any kind of weighting system such as downriggers, copper line or leadcore line. They come in two sizes, 3 1/4″ and 4 1/8″. In general, the smaller spoon works best in the spring and the larger spoon works best later into summer and fall. However, it’s always best to let the fish tell you what they want. The Heavy Weight spoon is an a great casting and deep water jigging spoon. 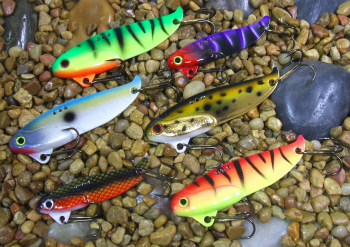 It has a great wobbling action and can be used for many different fish species. Use it in open water or ice fishing situations. 2″ 1/4oz. 3″ 1/2oz. 4″ 7/8oz. 5″ 1 1/2oz. The Light Weight spoon is a paper thin trolling spoon with a big wobbling action. It can also be used while ice fishing when a slow falling presentation is preferred. 2″ 1/16oz. 3″ 3/16oz. 4″ 5/16oz. 5″ 7/16oz. This is a light weight spoon that has a very unique, slow shake when falling. 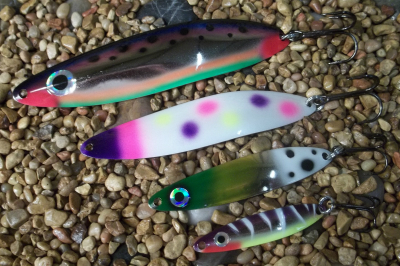 When used as a jig, the slow falling action mimics a struggling, or injured baitfish. The big fish can’t resist! 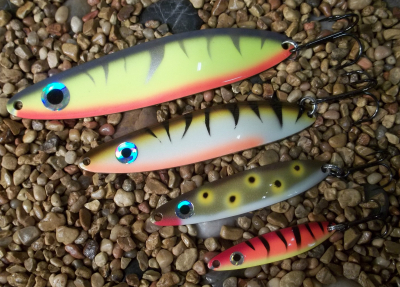 The Shimmy Spoon was designed as an ice fishing lure that can be slow jigged or used on a dead stick rod. However, it can also be very effective trolling. Outstanding on walleye, steelhead, brown trout, perch and panfish. Our blade baits will catch just about anything that swims. They can be used casting, vertical jigging and even trolling. They can also be deadly throughout the ice fishing season. 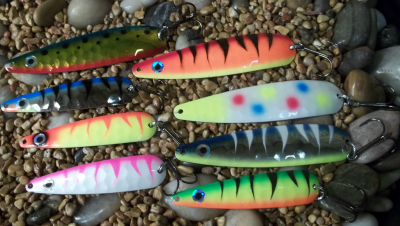 We have plenty of proven, hand airbrushed colors to catch a lot of different fish under all types of water conditions.